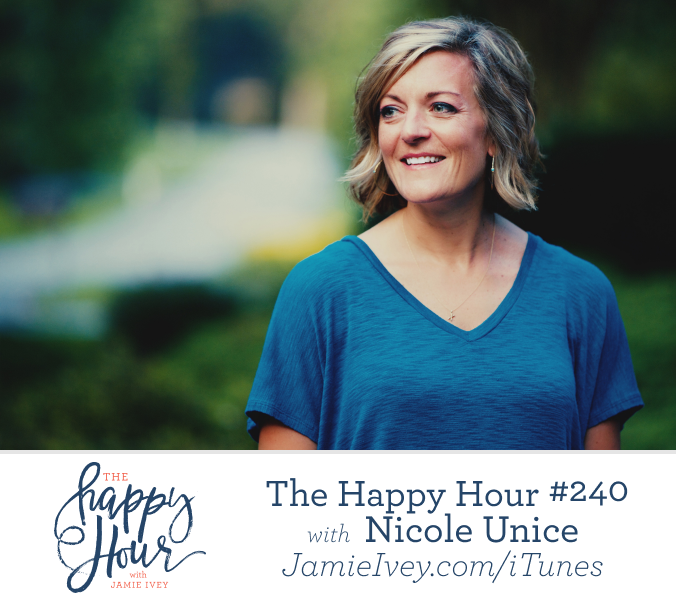 My guest for The Happy Hour # 240 is Nicole Unice. Nicole is a Bible teacher, author, and passionate communicator who delights in bringing God’s Word to life in a personal and relevant way. Her training as a counselor informs her work, as she emphasizes the importance of facing our own reality and embracing the transforming power of God’s grace. Nicole serves as a pastor on staff at Hope Church. Nicole and I start off the show chatting about kids starting to drive and I just loved Nicole’s idea of how to use the family car. We then dive into talking about the struggles with contentment. She describes how we are so often trying to get to the next thing that we don’t see what God has put in front of us today. I loved hearing her prayer to live each day as an adventure that God is partnering and leading us on. Nicole then speaks of how the past can impact our present reality, but it does not have to define it. She encourages us to stop saying “but, it’s not a big deal”, and instead confront the past to allow opportunity for healing and true freedom in Christ. Lastly, we chat about leadership, and no matter what your sphere of influence looks like, we can all be conduits for reconciliation for others. Pre-Order Nicole’s next book: Help! My Bible is Alive!